In this beautiful VIS image, taken by the NASA - Mars Odyssey Orbiter on March, 8th, 2006, and during its 18.769th orbit around the Red Planet, we can see, once again (such as after the APODs of December, 28, 2014 and December, 29, 2015) a small portion of the Floor of the Martian Region known as Nili Fossae. Also in this picture, the light and dark-gray Areas (look at the central and upper portion of the frame), which are likely Dust and small Rocks mixed together, are thought to be Basaltic in origin. Furthermore, NASA Scientists discovered that Nili Fossae is the source of Plumes of Methane, raising the intriguing question of whether this Plumes might originate from Biological Sources. Several Researchers, in July 2010, suggested that the Carbonate-bearing Rocks found in the Nili Fossae Region are made up of Hydrothermally altered Ultramafic Rocks. Consequently, and therefore, some local and highly significant Hydrothermal Activity must have provided (or must STILL provide!) sufficient energy for the development of Biological Activity - and some (perhaps "exotic", who knows...) Evidence of living Indigenous Organisms could have been preserved (even now). Last, but not least, the Great Nili Fossae Trough is thought to have resulted from the same Impact Event which formed, as we wrote herebefore, the nearby gigantic Isidis Basin. 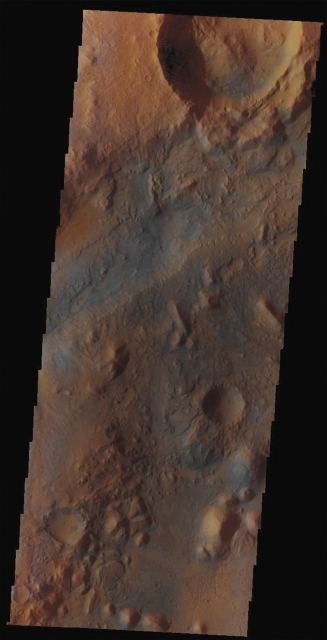 This image (which is an Original Mars Odyssey Orbiter falsely colored and Map-Projected frame published on the NASA - Planetary Photojournal with the ID n. PIA 20229) has been additionally processed, magnified to aid the visibility of the details, contrast enhanced an sharpened, Gamma corrected and then re-colorized in Absolute Natural Colors (such as the colors that a normal human eye would actually perceive if someone were onboard the NASA - Mars Odyssey Orbiter and then looked down, towards the Surface of Mars), by using an original technique created - and, in time, dramatically improved - by the Lunar Explorer Italia Team.